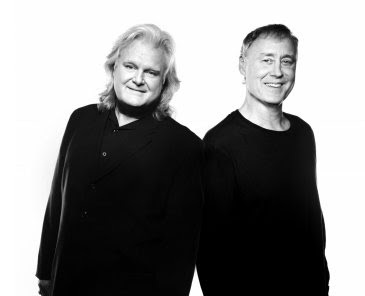 Nashville, Tenn. (January 10, 2017) - Country and bluegrass legend Ricky Skaggs and renowned pianist and songwriter Bruce Hornsby, fellow friends and GRAMMY® winners, will soon hit the road once again to collaborate with Skaggs' razor-sharp band Kentucky Thunder on brand new tunes and traditional bluegrass classics. The "Ricky Skaggs & Bruce Hornsby with Kentucky Thunder" tour kicks-off on February 26 in Tarrytown, NYwith additional New York dates to follow, as well as stops inPennsylvania, New Jersey, andDelaware. Without any restrictions, their music is as fascinating and masterful as the two stars that created it. The pair blends songs drawn from deep roots in mountain music, adding piano and Hornsby's inimitable songwriting to Skaggs' instrumental core of mandolin, guitar, bass, fiddle and banjo into a musical feast. Punctuating the show is a vibrantly expansive version of Hornsby's early hit "The Way It Is" and a performance of "White Wheeled Limousine," and to sum up the free-spirited nature of their collaborations, Skaggs and Hornsby joyfully present the vintage fiddle tune "Cluck Ol' Hen." Skaggs and Hornsby promise to kick up a storm with their mix of high-lonesome harmonies, full throttle bluegrass picking, and improvisational piano.